I just want to start this post by stating that I appreciate Veterinarians so much. We love our cats, dogs, animals, etc, and though we do as much as we need, it’s a vet who can keep our pets healthy. 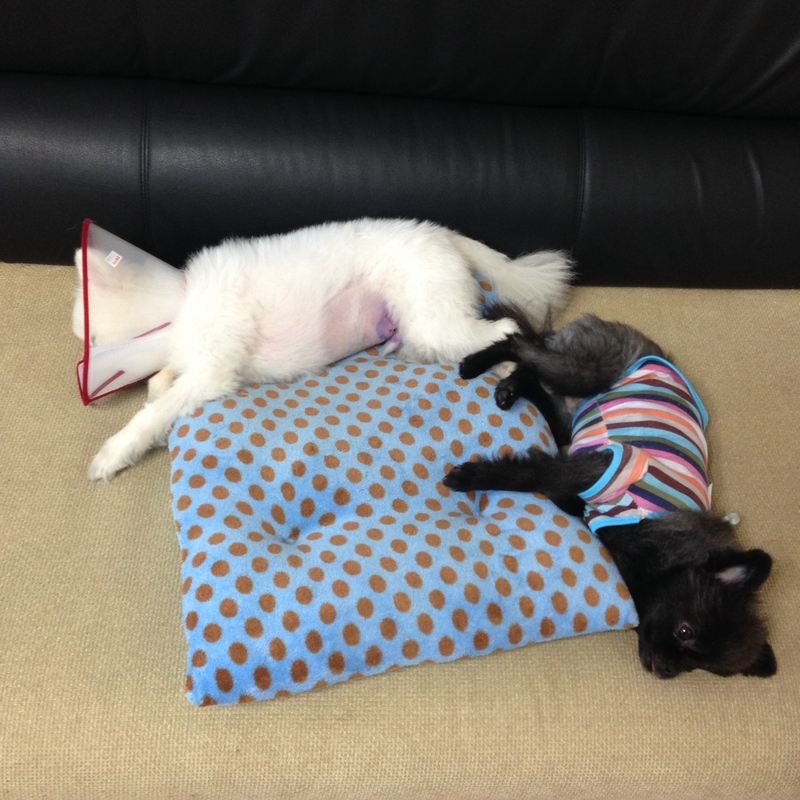 I was worried prior to coming to South Korea,that I would not find good vets or veterinary care, but this week, I really learned I had nothing to worry about. Last week, John and I had a scare with our pup Milo. I came home for lunch and after taking the dogs out, I noticed tiny little drops of blood on the floor. There wasn’t much and after cleaning it, I checked both dogs and didn’t see anything suspicious. I had a lot to do that day, so during my lunch break my mind was in many places and I didn’t react to what it might be. I tried to finish what I was doing and then after checking to make sure everything was set, I went back to work. Since we were on the intensive schedule, I worked for the next 4 hours or so. After teaching, I was in the office grading book reports when I got a text from John saying that we needed to take Milo to the vet. 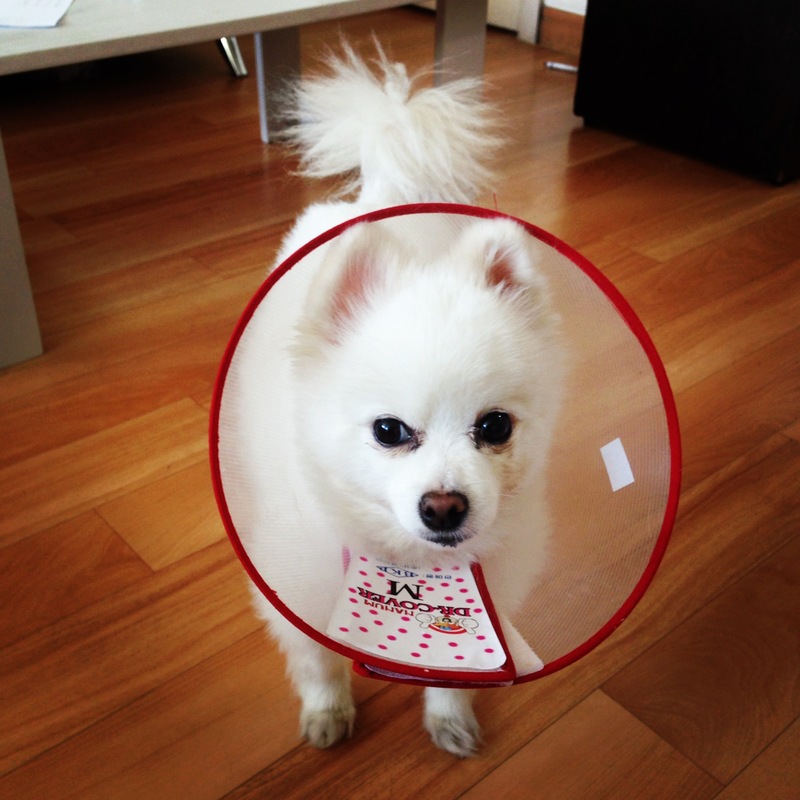 When John had gotten home, he took the dogs out and noticed Milo had blood in his urine. I then connected the dots, from the afternoon, and less then 10 minutes later met John to go to the vet. First of all, I want to say that we are very fortunate that just like the human body, the dog body will show signs and symptoms of when something is wrong. John and I are well aware of how our dogs are on a normal basis, so to catch the blood early was a good sign. It’s also nice since it’s basically the voice for the dog. Had there been no blood, I don’t know what would have triggered us to go to the vet so soon. The second thing I wanted to point out was that we are lucky that a vet is a 5 minute walk from our apartment and that anytime we have walked in, the veterinarian has quickly taken care of us. So, we walked into the vet and the veterinarian took us to his examination room immediately. He is a great vet and speaks a decent amount of English, so we were able to explain what we had seen with Milo. He then took 3 X-rays and also performed an ultra sound. When all was finished, he gave us a diagnosis. 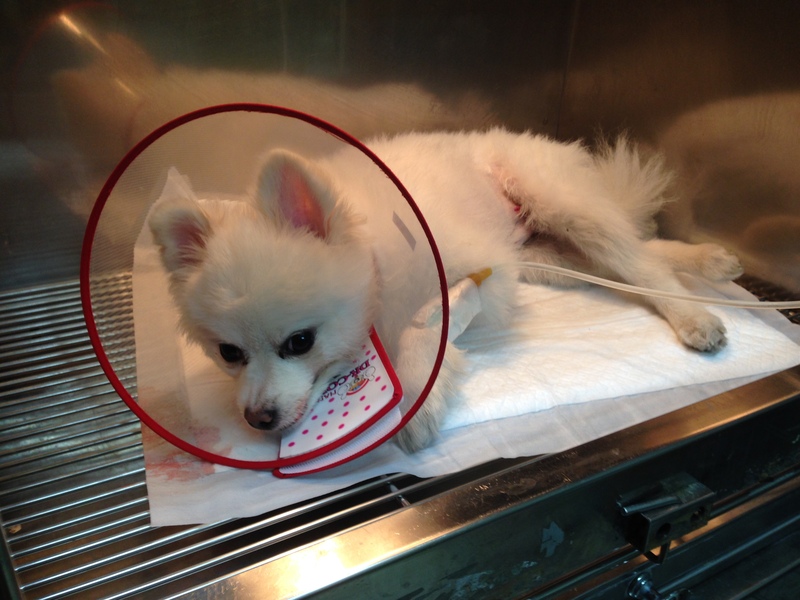 Milo had 3 bladder stones. I was happy to know that there was a reason for the blood and then wanted to know how we could fix it. I thought that there must be a medicine Milo could take. Then, the vet told us the scary part, that the only real successful way to treat it was by surgery. Through a little translation misunderstanding, he also stated that it was an emergency. Any dog lover will know that emergency and surgery do not go well in a sentence. My instincts didn’t let me panic too much and told me that the surgery needed to be done. John agreed and within less than 2 hours of getting the text from John, heading to the vet and getting tests and X-rays, Milo was in surgery. I was so impressed by how quickly everything went. 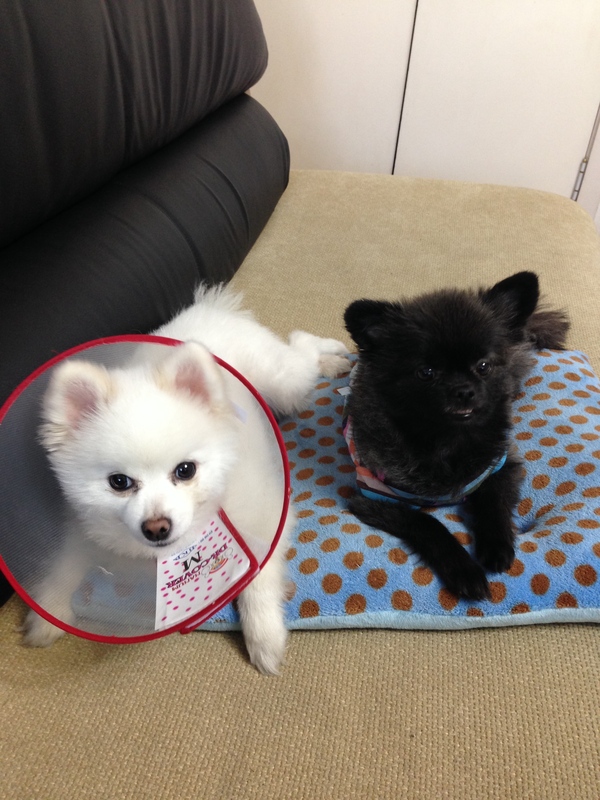 From the moment we got to the vet, we were seen, given a diagnosis, and given a solution. Milo was out of surgery that night and spent 3 days with the vet recovering. I did a little research on bladder stones and the veterinarian was spot on. Though there are some treatments where they will try and dissolve the stone first, almost all vets will recommend surgery. There is no clear reason why it happens in dogs, but it is common. The cost of this type of surgery in USA can range between $1000-$2500 alone, not including extra tests or fees. We were able to get the surgery, x-rays, an ultra-sound, medicine, and 3 nights at the vet for exactly 600,000 South Korean won, which is $540 dollars in the states. 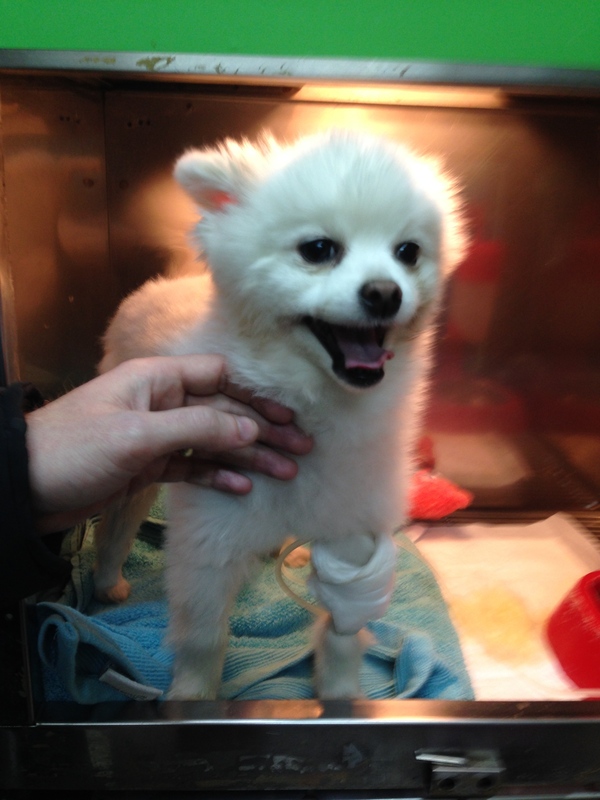 My dog was not only taken wonderful care of, but he was treated with no time to spare. The vet was also very caring to our needs and let us not only see Milo immediately after surgery, but he let us visit everyday until we could take him home. Milo, right after surgery. He was under a lot of anesthesia. 24 hours after surgery and already he was perky and doing much better! At home and on the mend in his cone of shame! He gets his stitches removed in a week so has to wear the cone till then! Milo is so cute. Glad you were able to get good care for him. Get well soon, little guy! 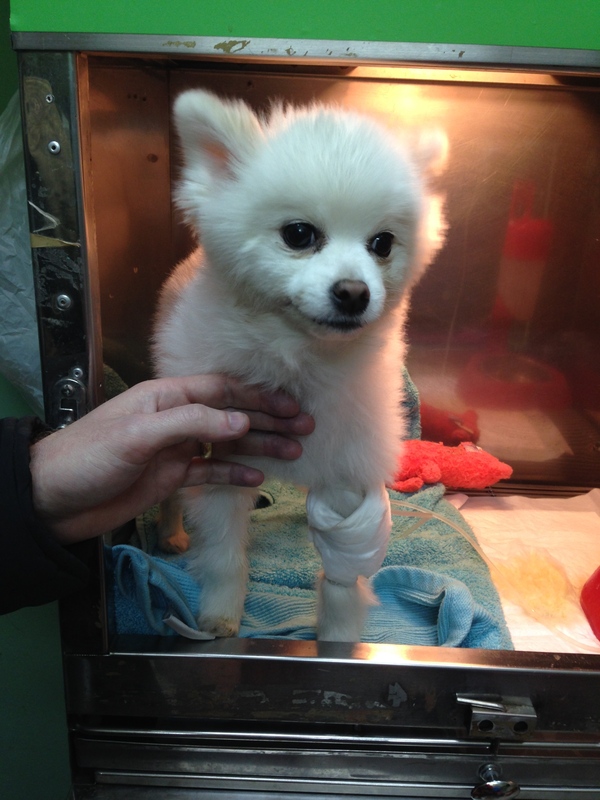 So happy to know that Milo is on the mend and that there are such good vets in Korea! He’s lucky to have such sweet parents! This group is “Every Expat In Korea” and is great for just asking any general question! A great pet group! It’s a closed group so you must request to join!